Posted on March 14, 2011, in jQuery, js, php and tagged comet, jquery, js, php. Bookmark the permalink. 42 Comments. Nice write up. You’re absolutely correct: we deployed this technique on a high traffic website and found the server frequently bottlenecking. We ended up using writing our own custom little server to handle the requests, as well as some back end caching to prevent unnecessary database calls. I must admit I didn’t use it in a hight traffic site but it works like a charm in a medium intranet. I avoid any database connection in the comet script and it works without significant server load. BTW I’ve got in my mind a similar script using node.js instead of PHP. With this example you are still just doing short polling. The difference is that you have moved the polling from the client to the server. If you use a more event driven model, you can greatly improve performance. You won’t have blackout periods between polling memcached or while sending the data out to the client. I’ve written a small PHP HTTP/WebSocket server that allows you to take incoming messages from your main server and distribute them to many client connections at once. The smaller server (which is based off of Tornado and called WaterSpout) listens for events from the main server and then distributes them immediately to the proper client connections. It uses WebSockets to ensure a constant connection but will fail over to long polling if WebSockets aren’t available. If you are going to be at Tek11 this year, stop by my talk on Realtime Communications. I’d love to chat about the challenges you’ve faced and the way you went about solving them. I’ve seen your talk about it at phpconference2010 (BCN). Definitely your talk inspired me a lot. In fact I’m the one who spoke with you (at the end of your great talk) at about the problems with proxy servers and websokets ;). Nodejs solution maybe is an smart and probably easy solution to the problem. Great work, I found it very helpful. Really interesting. Do you think Facebook/Gmail using the same way like this? I know they are using long-polling/comet. Is this the same? Why these two website still works like a charm? They have billions of users… Because of their amazing servers? No. This technique is not suitable for big traffic. Your server load will raise to hell, and that’s too expensive. I’ve wrote a second part of the post (https://gonzalo123.wordpress.com/2011/05/23/real-time-notifications-part-ii-now-with-node-js-and-socket-io/) doing the same with node.js and websockets/socket.io. That’s a better solution if you need to scale. FB/Gmail/Twitter’s servers aren’t amazing. The only amazing thing is the number of servers :). The solution of this post “works” but the solution of the second post works too and scales too. The “problem” with the second solution is that you need one extra server for Real Time communications. The problem with the PHP’s solution (The first post) is the IDLE mechanism used (the sleep function). Node uses functional programming and its way to send process to IDLE is brilliant (with callbacks). So different ways to solve the same problem, wiht its pro and cons. Thanks for your explanation. I’m still curious tho, is Facebook using node.js to get this work? I don’t think so. They published couple of years ago one similar open source project called Tornado (python based). It’s similar than Twisted (python too). As far as I know FB uses python in the back-end and probably they have one customized version of Tornado. The idea is the same than node.js. You are right. They are using tornado. How do I implement it on tornado? or I can simply use node.js? 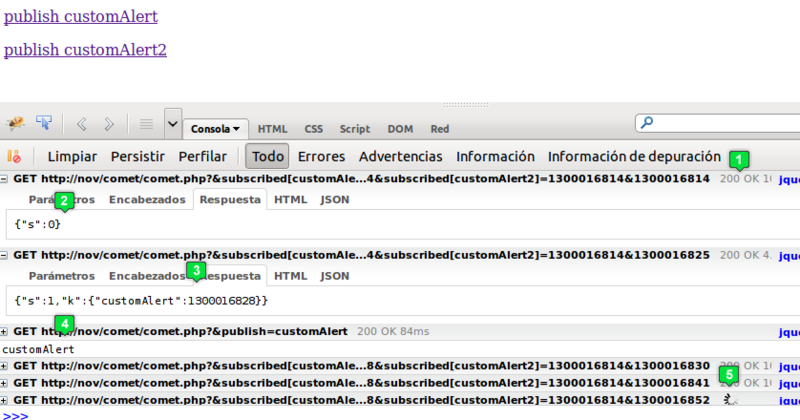 since i tried facebook on firebugs and found that they were using long-polling php as well. Should I set up another server to get node.js/tornado work? Actually i want to make real time notification in my php website but not geeting any idea.as go through the google i got your script but not working it too for me please help me. I sad that it was “almost” impossible. In fact this implementation is also PHP and plain js and it was available 5 years ago, but nowadays websockets plays in another league. Without websockets we could do it using exotic implementations (like the example of this post) or “emulate” real time with timers. The problems. With a limited number of users those implementations was viable. I have something similar than this post in production for for years in a intranet and it works like a charm indeed, but I now that that if I need to scale it I will have serious problems. Nothing compared to the simplicity of a node.js server with socket.io or even PHP with rachet. Can you reliably compare timestamps issued by different machines? I was wondering if it can support a publish action publish( ” my message”,”subscribed channel”) and subscribe (“subscribed channel” alert (“message” )? I was wondering if it was possible to modify it to support a publish function publish(“message”,”channel”) and a function subscribe ( “channel” ) ? How to use master ? I also came across ZeroMQ which is obviously using sockets to send/receive.. any comments on that? I am getting error on log console. Notice: Undefined variable: out in D:\Xampp\htdocs\RTN\NovComet.php on line 63. what is $out on this file. and how to solve this. Thanks. i just want to add extra parameter can you guide me?